The Skinny Diva Zero Calorie Foods Diet was created by Tiffany Taylor. She claims that when you follow her Zero Calorie Foods Diet and Exercise Plan you can lose 5-10% of your body weight the first week, then 3-7 pounds of fat every week thereafter. This diet involves reducing your intake of calories while you are allowed to eat an unlimited amount of “Zero Calorie Foods” so that you never go hungry. When you start the program you are encouraged to write a list of all the reasons why you want to get skinny and stay skinny. You should put a copy of the list in a place where you can read it daily to help maintain your motivation. Taylor says that the most difficult part of weight loss is maintaining your commitment to lose weight every single day. Defining your personal motivations for losing weight can make it easier for you to stick with your weight loss program. Outlined in the Zero Calorie Foods Diet are simple dietary guidelines with an accompanying meal plan. The eating plan is basically a reduced calorie, low fat diet that includes six small daily meals. You should always eat breakfast and never skip any of the meals or snacks. No cheating is allowed while following this plan, so until you achieve your goal weight you must strictly eat only the permitted foods in the prescribed amounts. You are given a list of “Zero Calorie Foods” that are so low in calories or high in fiber that you can eat as much of them as you like and still lose weight. Examples include green vegetables, fat-free salad dressing, pickles, V-8 juice and sugar-free popsicles. It is also recommended to drink at least eight glasses of water a day and take a multi vitamin and mineral supplement. Once you achieve your goal weight you are advised to follow the USDA nutrition recommendations to create an eating plan for the rest of your life and maintain your weight loss. Fruit, vegetables, bread, rice, pasta, oatmeal, cereal, skim milk, non-fat yogurt, non-fat cheese, lean meat and poultry, fish, eggs, beans, nuts, seeds, pickles, balsamic vinegar, bouillon, zero calorie salad dressings, salsa, soy sauce, Splenda, coffee. Every day you should do both aerobic and weight lifting exercise. You can choose your preferred aerobic activity such as walking, biking, jogging, swimming or aerobics classes and work up to 60 minutes a day. After your aerobic workout you then do weight training, alternating an upper body routine on one day and a lower body routine on the next day. The Zero Calorie Foods Diet includes descriptions of weight training exercises. 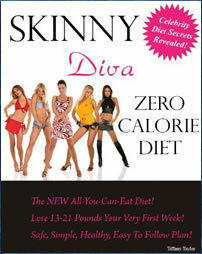 The Skinny Diva Zero Calorie Diet retails at $3.99 in eBook format. Also available by the same author: Skinny Diva Fat Flushing Cocktails, Smoothies and Slushies, Skinny Diva Fat Flushing Soup Cookbook, Skinny Diva Very Low Calorie and Tasty Spa Cuisine Cookbook and Skinny Diva Fat Flushing Vegetarian Zero Calorie Diet. Encourages the consumption of fresh fruits, vegetables and whole grains. Dieters can eat an unlimited amount of “zero calorie foods”, which eliminates hunger on a reduced calorie program. Eating small frequent meals decreases appetite and this reduces the risk of overeating later in the day. Includes a seven-day meal plan. Encourages regular exercise and includes an exercise plan. Emphasizes getting skinny rather than focusing on losing weight to improve health. Fairly restrictive and does not allow for dieters to include their favorite foods in moderation. Meal plan is lacking in adequate essential fats. Requires about 90 minutes for exercise each day. The Skinny Diva Zero Calorie Diet is a reduced calorie, low fat eating plan that allows for the unlimited consumption of “Zero Calorie Foods”. Dieters will probably lose weight on this program due to the reduction of calories and increase in physical activity, however it does not offer anything new in comparison to many other similar weight loss programs.